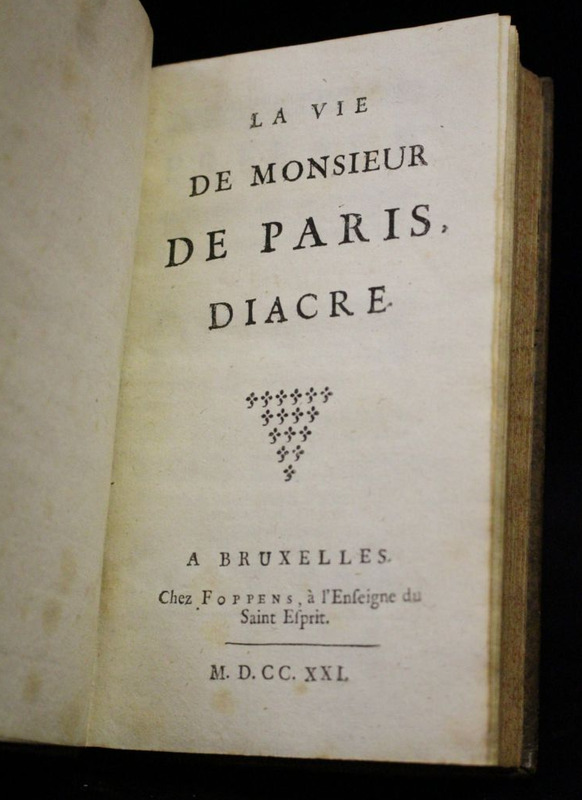 A little more on the diacre Pâris: The following is summarised and (loosely) translated from the first of the "lives" to be written, Pierre Boyer's , Vie de Monsieur de Paris, Diacre, which was published 1731, but probably composed in 1728. Back in Paris, he assisted at the parish of Saint-Côme. He avoided attempts to appoint him a canon at Reims Cathedral, and later to become the parish priest of Saint-Côme, a project backed by Archbishop Noailles himself. He consented to becoming a deacon in 1720 but resisted full ordination. He now withdrew to the Collège de Bayeux where he occupied himself in study and meditation, but always found time for deeds of charity. At this time and throughout his subsequently life, he offered sanctuary to persecuted Jansenists. He furnished them with all they needed - lodging, board and upkeep. He also consoled and encouraged them with his discourses and impressed them with his humility and engaging affability. (p.39). At this time he decided to devote himself entirely to God, and to find companions to join him in his life of penitence. "The Sainted Deacon did not loose sight of his great plan, which was to form an Ecclesiastical community of penitents. Several projects for regulations were found among his papers. In a word he wanted to revive Port-Royal on earth." Im 1721, about a year after his ordination as Deacon,he got to know a priest [the abbé Tournus] who had come to Paris from the provinces with a similar plan. After three months of retreat, animated by renewed zeal, he sold his furniture, his house in Palaiseau and dismissed his servants. He rented a room in the rue de l'Arbalète, next to the abbey of Val-de-Grâce in the Faubourg Saint-Marceau. He now severed all connections with his former colleagues, going only by the name of "M François". "He saw all about him and under the same roof, only working people, and the poor. In his room everything breathed poverty; the bare walls; the total lack of furniture, even a cupboard; his bed with but a poor mattress; the fireplace which he lit only for cooking; windows that closed badly and faced North. There M. de Paris prepared his own food, eking out a tiny portion of meat. Later he renounced meat entirely, having already renounced wine; his most substantial meal in his solitude was hard-boiled eggs. They observed a constant regime of fasting and abstinence; the only exceptions were Christmas, Easter and Pentecost, when M. Paris had a small portion of meat brought from the local auberge for himself and his companion. They took only one meal, at six o'clock in the evening. It consisted of cabbage soup and boiled rice, with cheap rough bread. They would cook a quantity of cabbage in one go which would serve to provide pottage for a dozen or so days. They picked these cabbages as they needed them. They also cooked enough rice for a week. M. de Paris decided this was not extreme enough and without the regard he had for M.Louis he would have reduced himself to bread and water. 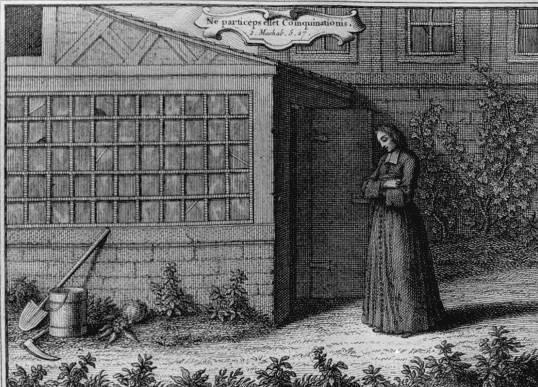 They tended the garden themselves; it was the duty of M. de Paris to draw water from a deep well and to do the watering. The housework was also shared between the two solitaries, but M. de Paris took over the most humble and humiliating tasks. The Holy Penitent always wore linen but he wore only the most coarse serge shirts; the start of this mortification originated with an act of charity towards a poor man whom he met in the street almost naked; he had taken him into a quiet dark alley and given him the shirt he was wearing; from that moment on he did not care to wear good shirts again. In the beginning he slept fully clothed on a hard palliasse , often on the bare earth...Subsequently he yielded to his confessor who made him use a mattress; but it was hard, poorly made one, more likely to cause suffering than to relieve it. Later on he slept on a miserable plank that had served as a shutter or a door. In the end, he used an overturned wardrobe. We are already remarked on the love that the Sainted Deacon had for Evangelical poverty, but he pushed the practice much further when he buried himself in the rue de Bourgogne. He practised to the letter, without taking formal vows, the regime prescribed to the poorest Religiuex. [He gave over all control of his revenue to his brother and asked for funds as for charity]. [He added] humiliations in the view of the whole Church, as if a man so innocent and pure was distined to make of himself a public victim of expiation. When the faithful of the parish assembled, he left his retreat with the air of a penitent worn down under the weight of his sins, his eyes lowered, his head bent; he entered the church and took the last place...Although with his Ecclesiastical robes and tonsure, he always remained in the lowest ranks, among the poor(p.94-5). The deacon decided to take up weaving but was double-crossed when he tried to acquire a loom. 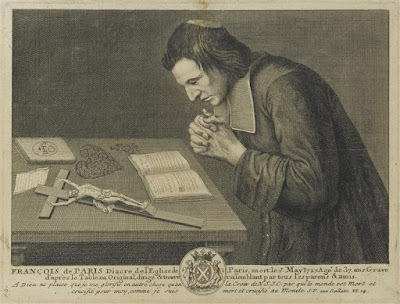 At the insistence of the curé of Saint-Médard and of his confessor, he was obliged up duties in the parish, teaching clerics and catechism classes. He was joined by a third companion, M. de Congis, and received various Jansenist sympathisers whom he sustained at his personal expense. At this time his penitence redoubled; he lived on a sort of potage of boiled vegetables and slept on an old cupboard with a stone for a pillow. The Vie describes his piety, works of charity and his dedication to the Appelant cause, including the idea that his penitence stood to assuage divine anger at the Bull Unigenitus. There follows an account of his final pilgrimages, last lingering illness and death.